Ballast means the stone or rock paving above the railway embankments including coarse grave and crushed stone or rocks etc. Ballast is used widely in road construction and railway embankment construction etc. For example, track ballast, the layer of crushed rock or gravel upon which railway track is laid. Ballast crusher includes jaw crusher, impact crusher, cone crusher applied widely in aggregate railway, highway road construction, etc. Ballast jaw crusher is usually applied as the first or primary crushing equipment in ballast quarry plants. After first crushing process, impact crusher or cone crusher take part in secondary crusher machines. In order to get fineness ballast products, we usually use sand making machine or VSI crusher as final crusher equipments. Ballast mobile crusher includes jaw mobile crusher, cone mobile crusher, impact mobile crusher, multi-crushing type mobile crusher and crawler type mobile crusher etc. 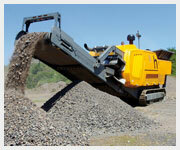 ZENT can supply you ballast crushing and screening plants in mining industry and industrial construction. Soft materials such as limestone are not particularly suitable, as they tend to degrade under load when wet, causing deterioration of the line; granite, although expensive, is one of the best materials in this regard. Ballast mobile crusher also named portable station or mobile crushing plants applied widely in ballast crushing industry. Ballast mining equipment includes ballast crusher, industrial grinding mill, feeding machines, screening equipments, conveyor belt systems, ballast washing machines etc. ZENT Machinery Co., Ltd is a manufacturer of ballast mining equipments supplying you all kinds of gravel crusher, ballast crusher, stone crusher, ore crusher, marble crusher, limestone crusher, ballast crushing plants with reasonable price, perfect after-sale service and high products quality etc. ZENT ballast mining equipments include crusher and mills have exported to many countries such as India, Indonesia, Vietnam, USA, South Africa, Egypt, Philippines etc.